I couldn't resist the temptation to share this delicious treat. The reason is that the sweetened condensed milk, the main ingredient of this recipe is so fashionably current. Condensed milk has always been a base for most desserts in Brazil, and we also have other recipes that use it here, such as Pink Pudding and its variation, Pumpkin Pudding. First, a bit of history: Brigadeiros are the most popular sweet bites in Brazil. They are easy to prepare, easy to eat, and are a never-forgotten staple on a birthday table. New versions of the classic recipe are being prepared in elegant restaurants and reinterpreted creatively everywhere. My twist on the recipe is just its coat: instead of chocolate sprinkles, I substitute high-quality Belgium milk chocolate. 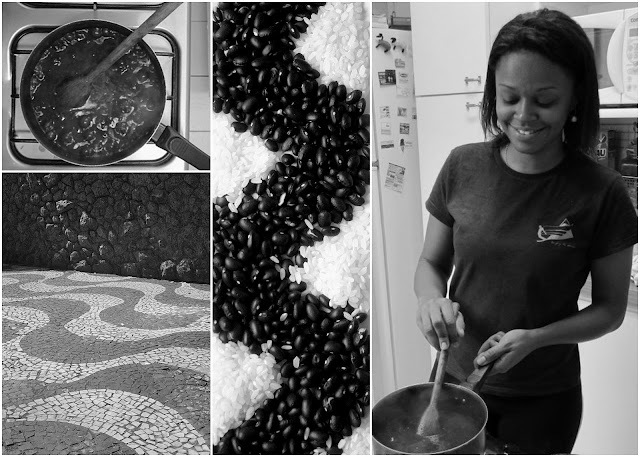 With you, the smooth sweetness of brigadeiros! Sweetened condensed milk is available at Asian markets, Trader Joe's carries an organic version seasonally (according to my local manager), and Target sometimes has its own brand. In mainstream grocery markets, such as Raley's/Nob Hill, condensed milk La Lechera can be found in the Mexican food section. Melt butter or vegetable spread in a heavy-bottomed pan. Gradually add condensed milk, stirring vigorously with a heat-proof spatula such as Le Creuset. Add powdered cocoa and keep stirring. Lower flame and stir constantly, always taking care for the dough not to burn at the bottom of pan. When a caramel fudge texture is reached, turn off the heat and transfer mix to a plate coated with butter or vegetable oil and let cool. 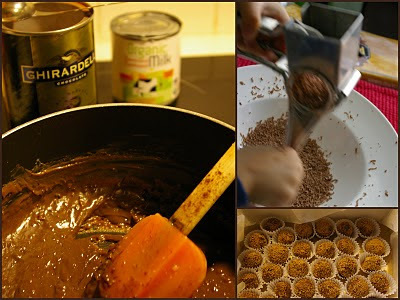 When completely cold, roll in small balls (about one teaspoon) and coat with grated chocolate.